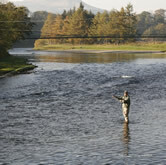 The Teviot and The Tweed are both within 20 minutes drive. Also, just a few minutes drive away are the Hass Lochs stocked with trout for the avid angler. The River Tweed has always been internationally famous for its salmon fishing, with people coming from all over the world to fish it. Brown trout and sea trout are also there to be had. Also an outside freezer where your catch of the day can be kept until your homeward journey!